Boy, we're happy to see this boy's Archangel costume! It's a refreshing change from the basic angel costumes we typically see. Usually, angel costumes involve some sort of white dress with fur trim and a pair of feathery wings, you know the kind we're talking about— they're often seen on Valentine's day cards holding harps or bows and arrows. Those angels are great, divine even, but we're glad to see a different angel costume, one depicting the tougher side to angels. Angels have to be tough since they're always guarding us. The boy's Archangel costume depicts the highest rank of an angel, transforming a mere child into the Chief of all Angels. Look like a seraph storming into battle, depicting scenes directly lifted from the scriptures for school and church plays or just for fun. 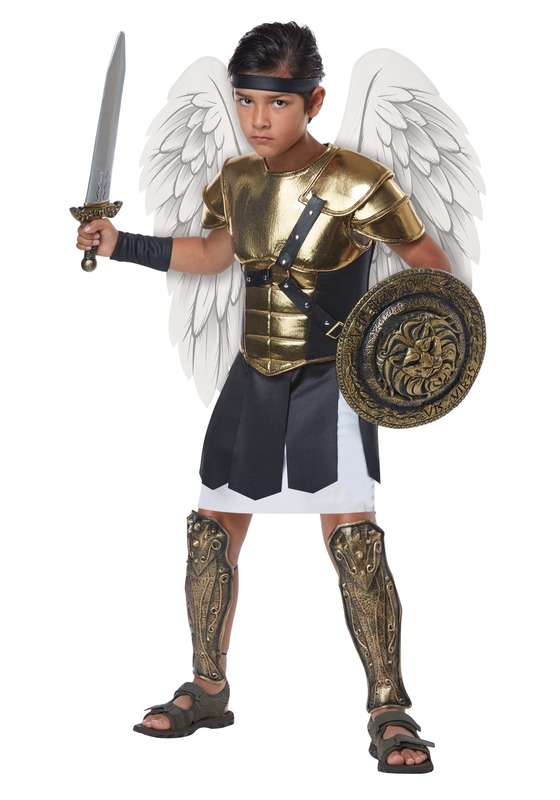 The perfect mix of tender and tough, the boy's Archangel costume perfectly captures the essence of a true Biblical hero. It comes with everything needed (except the weapons) to look like a warrior angel, not the kind who sing in the choir. (Although, those are great too.) The white knee-length tunic is topped off by a gold-foil armor chest piece. A faux-leather belt with gold buckles adds a pop of color against the shimmery fabric. The matching headband, shinguards and wrist guards are included to offset the buckle detailing and achieve a warrior appearance, while the mighty wings provide a necessary angelic touch, completing the look. It's a saintly costume, coming with everything needed except the sword and shield pictured above. Browse our accessories to add the gladiator combat shield and sword as well as the gladiator sandals for the exact look. Now, strike a fierce pose! It's a great costume to add to a Christmas pageant to spice things up this holiday season.